What is the best foam cannon? For those that are really into their car detailing, a crucial piece of equipment is a foam cannon (otherwise known as a foam lance). Foam cannons are excellent devices when it comes to pre-washing a car. In the winter months especially, it’s important to prewash the vehicle as this will safely remove the top layer of dirt and grime that is resting on the car. Should it be the case that this isn’t removed, it can result in scratches and swirls in the paint which is extremely unsightly. They engulf the car in thick, creamy foam which will help break up the grime and road dirt and allow it to be easily rinsed away before a contact wash is used. When it comes to using a foam cannon/lance, a pressure washer is a must have. It is important to note though that expensive foam cannons are not required. The reason for this is that by and large they all come out of the same factory and you’re merely paying more money for having a name attached to the cannon. To that end, we’ve compiled a list of just two foam cannons. An important thing to look for any foam cannon is if brass connectors are in it. The reason for this is that it will not corrode nor will it crack over time. Thankfully, the MATCC foam cannon is built with brass fittings. The bottle is made from high quality plastic and it can hold up to one litre and therefore ensures that the proper amount of snow foam is used to properly pre-wash the car. The bottle is extremely sturdy and will last for a long period of time. This is an ideal option for those that are professional car detailers and getting through a lot of cars in the week as part of their job. It’s inexpensive and means that the money saved on it can be used on other car detailing products. It also has the extremely common ¼ inch quick connect connector. This means that it is compatible with a variety of pressure washer guns. These are required in order to use the foam cannon as they control the amount of water that enters it. Some pressure washers come supplied with them, however, this isn’t always the case. However, MATCC also make an excellent pressure wash gun that works really well with their foam cannon. 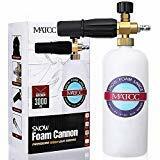 Adjustable Snow Foam Lance with 1/4" quick disconnection fitting.Upgraded nozzles, nozzles and plastic joints are tighter and less swaying.Capacity:0.22 Gallon(1L) . Requires pressure washer to Have 2.0GPM & Over 1450 PSI Pressure for use.Requires pressure: 100BAR - 1450PSI; Maximun pressure: 200BAR - 3000PSI; Maximum flow:5.3Gpm. 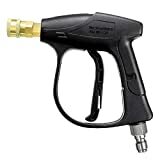 Pressure Washer Gun with 1/4" Quick Connector fitting. Pressure washer gun is 3/8" quick disconnect inlet fitting .Don't fit Metric M22-14mm inner connector. For those that have a Karcher Pressure Washer, there is specific foam cannons required. Karcher make their own version, although the bottle itself is pretty small and it means that the snow foam gets used up pretty quickly. Instead, Autocare have stepped up and made a foam cannon that works specifically with K series Karcher Pressure Washers. As with the case of the MATCC variant, the bottle is one litre in size and is made of high quality plastic. This means that should you ever drop it, it won’t crack. Similarly, brass fittings and connectors are used for the unit. Since this is specially made for Karcher pressure washers, no additional wash gun is required. Instead, it connects to the one that is supplied with the pressure washer. 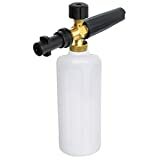 It provides an excellent amount of foam and the easy to use nozzle on the top of the unit allows the user to change the spray pattern of the foam. Likewise, it is extremely easy to change the consistency of the foam depending on how dirty the car is. The professional foam lance works perfectly with Karcher washer and other high pressure washer. Combines a high pressure water flow mixed with detergent and air to produce thick clinging foam.